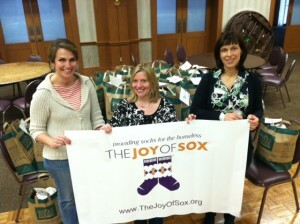 Sock sorting event at Shir Ami Congregation netted 853 pairs of socks for the homeless and The Joy of Sox. From L to R Rachel, Gail and Holly. Tonight we had a really nice event – a sock sorting party at the Shir Ami Congregation in Newtown, PA. The event was organized by Gail Rose, and among the adult helpers that agreed to be photographed, were Rachel and Holly. The amazing thing was that 18 or so “energetic” third graders, and a handful of 6th and 7th graders (plus a few Moms) were able to get so much accomplished in only a few hours. Many thanks to the people of Shir Ami that came out to help. And it was a 7th grader who knew figured out that the homeless man in San Antonio who follows us on Facebook probably has access to a computer at a local public library. What a great way to spend a Wednesday evening, and those socks are an initial part of our 1,200,000 Happy Toes Initiative – Philadelphia (more on that later). Sock sorting event at Shir Ami Congregation netted 853 pairs of socks for the homeless and The Joy of Sox. From L to R: Rachel, Gail and Holly.